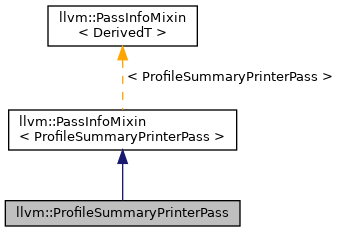 Printer pass that uses ProfileSummaryAnalysis. Definition at line 166 of file ProfileSummaryInfo.h. Definition at line 171 of file ProfileSummaryInfo.h. Definition at line 309 of file ProfileSummaryInfo.cpp. References llvm::PreservedAnalyses::all(), F(), llvm::Module::getName(), llvm::AnalysisManager< IRUnitT, ExtraArgTs >::getResult(), llvm::ProfileSummaryInfoWrapperPass::ID, llvm::ProfileSummaryInfo::isFunctionEntryCold(), and llvm::ProfileSummaryInfo::isFunctionEntryHot().